From rich, fruit-laden Christmas Cakes and creamy luxury chocolates and fudges, to tantalisingly tangy cranberry chutney, warming Mulled wine and light, bubbly Prosecco, we simply can’t get enough of the delectable flavours of Christmas – and you’ll find them all, and so much more, in the stunning range of luxury Christmas hampers from Handmade Hampers. We’ve lovingly created a sensational yet affordable collection of Christmas gift hampers that are packed to the brim with luxurious sweet and savoury foods, the finest quality drinks and extra special treats and nibbles. All of which will surprise and delight their lucky recipient and make their Christmas even more memorable! 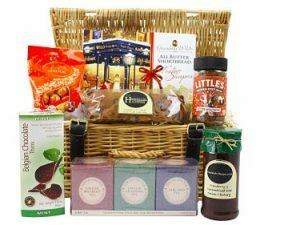 With so many Christmas hampers to choose from, each of which capture the very essence of Christmas, you’ll find something for everyone on your gift list – whatever their tastes, and your budget. 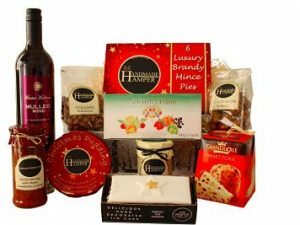 Every single product in our Christmas food hampers has been hand-selected by us, and you’ll find irresistible award winning food and drinks from many of your favourite luxury brands. From Bollinger Champagne and Chateauneuf du Pape to cheese from the Snowdonia & Cheshire Cheese Companies. We only include quality products from brands that we absolutely adore in our food and drink hampers, which gives each of our hampers the wow-factor from the moment that the lid is lifted. Whether you’re searching for an elegant corporate Christmas gift hamper to reward your hard-working staff or thank a valued client, or you want to spread the Christmas joy with an exciting and treat-packed family Christmas hamper, we’re sure we have one that’s just perfect. 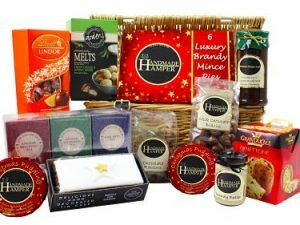 Ordering your Handmade Hampers Christmas Hamper is really easy, as you can choose a date for delivery that’s right for you. 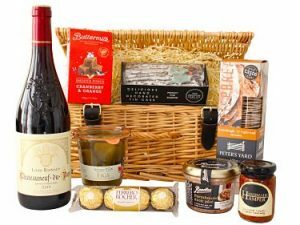 We offer a great choice of delivery options for all of our hampers, including Saturday Delivery, AM Delivery, Next Day and Named Day Delivery. Send a small token of festive spirit with A Christmas Carol Gift Hamper. Choose your favourite bottle to accompany the Yuletide treats inside this Christmas gift. 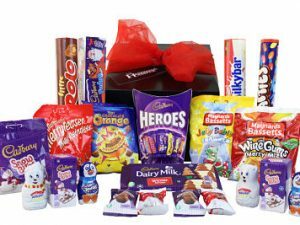 The Christmas Sweets Gift Box is filled full of our favourite Christmas chocolates and sweets. A perfect way to send your Christmas wishes this holiday time. Send your friends and loved ones a little bit of Christmas cheer with the Deck the Halls Christmas Gift Hamper. A festive hamper filled full of delicious Christmas treats. A winner on anyone’s gift list. Brimming with Christmas treats the Jingle Bells Christmas Gift Hamper is the perfect choice to be enjoyed with friends. Coffee, cake, biscuits and sweets all filled full of Christmas spirit. The Joy to the World Christmas Gift Hamper is filled full of festive favourites. Presented in a traditional willow hamper basket this gift is brimming full of treats to delight any recipient. 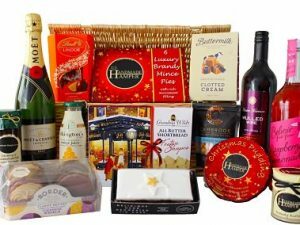 Full of delicious luxurious treats to accompany the bottle of your choice the prestigious Let it Snow Christmas Gift Hamper is a superb luxury gift choice. Send your loved ones a box full of Christmas cheer with our Silent Night Christmas Gift Hamper. Full of festive delights and tasty treats. Celebrate the Yuletide festivities with The Indulgence Christmas Gift Hamper. Laden with sumptuous festive delights to spoil you over the holiday period. Wine, Prosecco and prestigious Champagne to accompany the sweet and savoury treats. Something for everyone to enjoy, a perfect gift to be enjoyed with family and friends! The White Christmas Gift Hamper is full of delicious Christmas treats. Perfect to send as a luxury gift or to just enjoy with family and friends. Spoil your loved ones and friends with the delicious treats filled inside the We Three Kings Christmas Gift Hamper. A Christmas gift to delight any recipient.